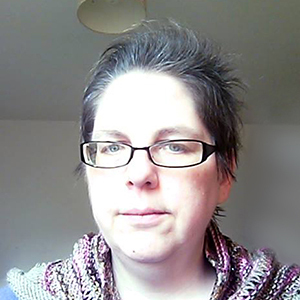 Louise Auty, 10th April 2019. A good marketing plan is essential and this blog is going to walk you through how to create a successful marketing campaign plan in five easy steps. While it’s common knowledge that you need a business plan, many businesses don’t realise their marketing plan is just as vital. So where do we start? A marketing plan should focus on winning – and keeping – customers or clients. It’s a strategic plan and includes objectives, facts about your business and the necessary numbers you need to demonstrate success. Before taking the first step on your “how to create a successful marketing campaign plan” journey you need to know where your business is now. Running an analysis of the state of your existing business gives you the necessary platform you need when it comes to finding your unique selling point and identifying strengths – and potential weaknesses – in what you’re offering. Target audiences are becoming ever more specialised and segmented and it doesn’t matter which industry you work in, you need to be able to position your product competitively and that requires an understanding of your niche. You should be able to describe what you offer but also be aware of the competition and what direction the industry might be changing and why customers should choose you over another company. This situation analysis allows you to establish what type of buyer is most likely to choose your business. You can’t offer everything to all people so identify where you can bring real value. This leads on to step two. Defining your target audience is as important as working out what your present business can offer potential customers. We’ve written about how vital these are before in a number of blogs which you can find here: How To Create Buyer Personas and here: Buyer Personas and Why They Are Important for Your Brand so do check those out as well. It doesn’t have to be overly complex. A one paragraph outline will work just as well as a detailed exploration of their lives. Are they single versus married? Male versus female? Extravagant or budget conscious? Each of these choices will inform how you market to them. Step three is possibly the most complex. You need to work out what are the goals for any promotional work you will carry out when you look at how to create a successful marketing plan. 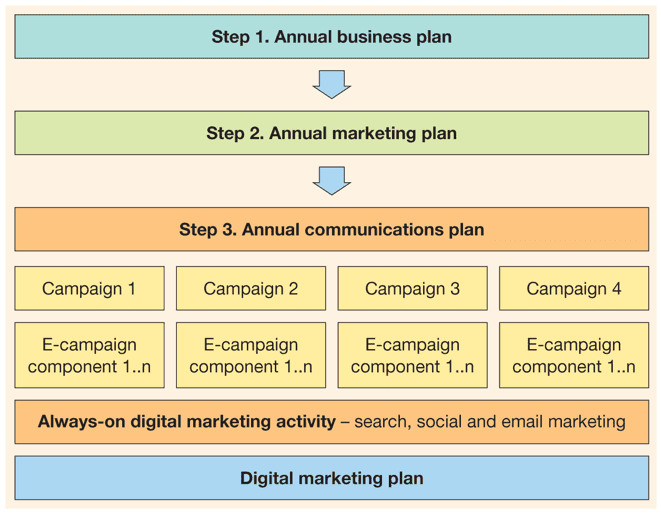 The graphic below from Digital Marketing: Strategy, Implementation and Practice. 6th edition (2015). Dave Chaffey and Fiona Ellis-Chadwick perfectly highlights how all your plans should align together. Smart Insights goes into more detail in its blog which looks at how to understand different types of marketing plan and how to work out which is the right one for your business. What do you want your marketing plan to achieve? For example, are you hoping for a 20 per cent increase in sales of your product per quarter or do you want to increase footfall into your retail premises by 10%? Are you launching a new product or have you just gone through a rebranding exercise and want to inform your regular customers? Whichever of these goals is chosen, the next step will be the same. During this step you will look at how you will deliver your campaign. A successful marketing campaign plan will target potential customers at each stage of the sales cycle. This will include cold call tactics through advertising, public relations exercises and direct marketing. For “warm prospects” – people who have previously been customers or who have signed up for newsletters or who’ve attended an event you’ve run – you can use permission-based email campaigns, loyalty programs or discount schemes. Your hottest prospects are people who have already been exposed to your marketing and messaging and are seriously considering closing a sale, whether that’s signing up for a service you offer or buying your product. For these people, a personal touch is the best method to use, a chatty email or a quick phone call combined with your marketing campaign offers, usually gives a boost when it comes to closing deals. Look at what platforms your customers are most active on. If they’re on Facebook, try some targeted advertising on your company page and offer discount vouchers or incentives to visit your retail premises. If they use Instagram, you can run participation contests and get your customers to upload photos of them using your products and then @ your official page and use a designated hashtag which people can search. Don’t forget to ask the people who know your customers best – your sales and customer services teams. They’re the ones dealing with your end users on a regular basis. Find out what the biggest problems are or what they think is missing from your offering, and look to see if you can solve that pain point. No matter what industry your business is in, you must dedicate a percentage of your projected gross sales to an annual marketing budget. It doesn’t have to be a large amount, but it must be there. Marketing is going to be of vital importance to the success of your business and, when it comes down to the individual campaigns, to theirs as well. With so many different ways you can market a business, there’s a method for every budget. 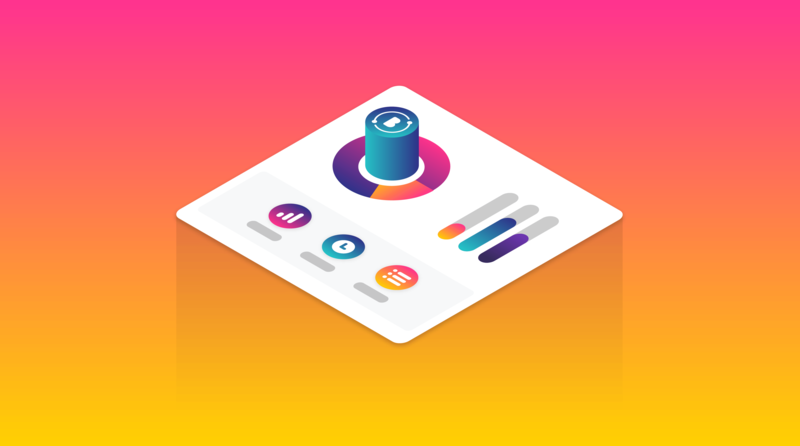 Once you’ve gone through the tactics from step four, you’re going to know which platforms and type of marketing campaign plan you’re going to run and this lets you set the budget accordingly. Work through it until you have a mix which is affordable and which you can stick to. Don’t ever stop your marketing plans, just tailor them to the money you have available. 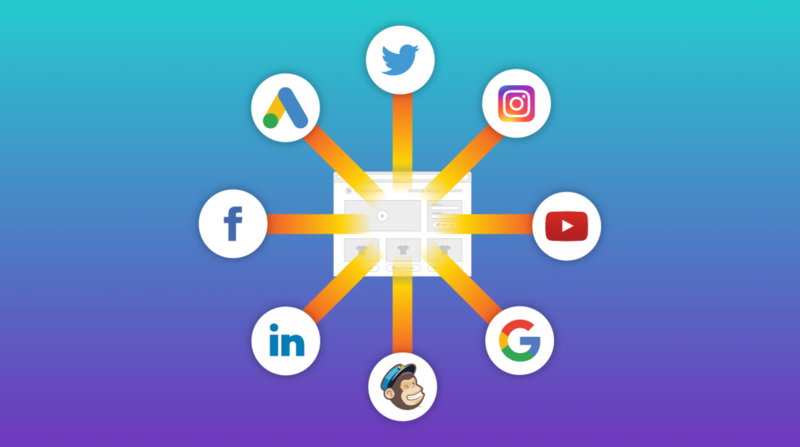 Social media campaigns are a great start for a small cash outlay if you want to try and reach a guaranteed audience by using a platform’s built-in ad program. But you can also run competitions and interactive quizzes at zero cost and still build up an audience. Entrepreneur has a great article which looks at 10 marketing strategy methods you can use to drum up business growth ranging from ones which involve time only – starting a blog or using social media – to ones which could have a financial outlay – creating video tutorials or working with influencers. So there you have it. Our five steps on how to create a successful marketing campaign plan. Any business will benefit from strategies which consider each of these points and which will demonstrate clearly how much progress has been made towards a defined goal. 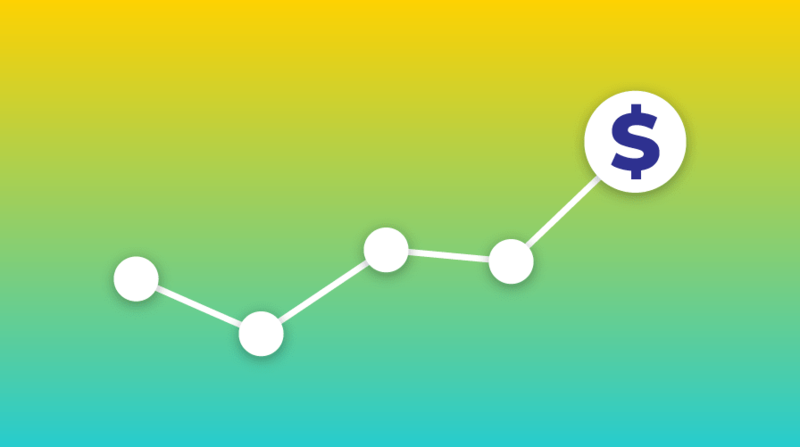 Our next blog will look at how to measure marketing campaign success and what refinements you can make based on those return on investments. 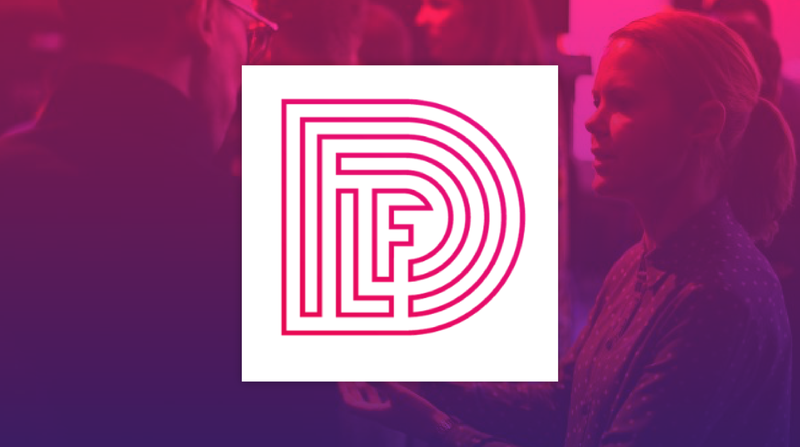 It’s time to hit the streets and catch up with all things digital as Leeds celebrates with its annual festival from 23rd April to 3rd May #LeedsDigi19.